There are many reasons why WordPress is the most popular CMS (website content management system). One reason is that it offers hundreds of free website themes. But with so many options, it can be confusing to choose the ideal theme. Here is a list of top 5 free WordPress themes that I believe offer almost everything you may need to design a powerful and elegant website. And much more. This WP theme is compatible with WooCommerce, bbPress, and multiple browsers. It is SEO optimised and supports several language translations. Drag & Drop Site Builder: This built-in, easy-to-use tool is hard to find among free themes. Flash Toolkit Plugin: This unique plugin works with more than half a dozen widget areas for a better-organised layout and interface. Layout Areas: There are specific areas for testimonials and team-member details that can be adjusted as per your needs. Filterable Portfolio: There is an advanced, filterable portfolio that allows you to showcase your work in an elegant and well-organised manner. Shapely is another amazing free WP theme that focuses on improving the process of web development. It combines beautiful graphics with practical elements to allow you to create the perfect WordPress website. This responsive theme supports high-resolution Retina display, which means you can include crisp and clear vector icons, text, and graphics on your website. Or create a powerful online store using WooCommerce. When you choose this theme, there is no need to deal with any coding. Customify, as the name suggests, is a highly flexible WP theme. It allows full customisation and can be used with Divi, Elementor and Beaver Builder. It provides an easy-to-use drag-and-drop editor that simplifies the process of creating beautiful and functional headers and footers. And the free theme is optimised for SEO and speed. This free WordPress theme is ideally suited for small businesses and bloggers looking for a theme with a clean layout. It has both classic and modern elements with focus on content. Feature multiple blog posts on the home page with images. Multiple Layouts: Grid layout, sidebars, and boxed layout. Google Fonts: This font comes along with various shortcodes and social integrations. Rich Posts: You can also create audio/video posts using this theme. Preconfigured Blocks: Blocks like About Us, Instagram, and Quote blocks help you save development time. So if you are looking for the most popular free WordPress themes, consider these 5 options. They are designed for ease-of-use and come with a wide range of features almost at par with premium WP themes. However, if you are looking for a highly customizable website theme then Divi by Elegant Themes is still my favorite and I build websites for clients using this if they don’t pick their own theme. I’m Jacinta Thomas, also known as your humble wordpress web design tech whiz and online marketing consultant. I’m a reserved yet highly motivated and adaptable digital marketing expert ready to use my online marketing knowledge to help your business be seen online and ramp up your sales. I love horses, dogs, cats, country music, chocolate and most of all helping people. I help family focused entrepreneurs build top ranking, self-managed websites, help work through any wordpress tech issues and get set up with hosting, blogging, SEO and social media, so they can earn more money and live their dream life. If you’re ready to get your business online, and seen on social media and all search engines then check out my blog, biz resources, jump into my free Facebook group and of course contact me at any time. 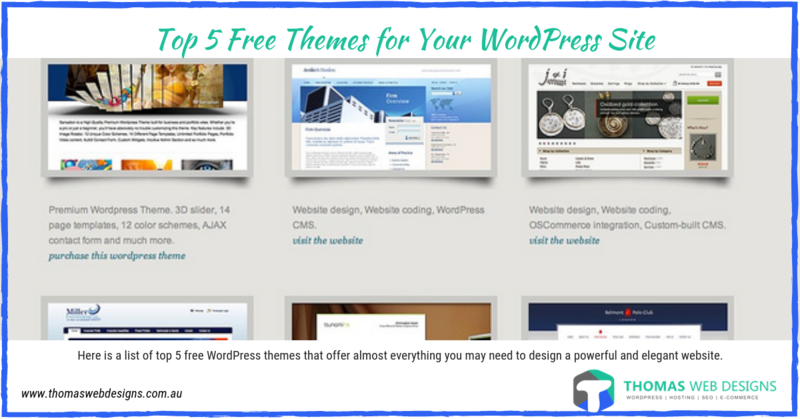 Here is a list of top 5 free WordPress themes that I believe offer almost everything you may need to design a powerful and elegant website.